Diamonds are a girl's best friend and crystals are a fake plug's best component. Looking at the wonderful selection of brilliant, shiny jewellery you can clearly see what we mean. Even at the smallest size you will be noticed far off. Multicoloured crystals embedded by single-coloured plugs ranging from silver and white to black and gold can give your look that certain something. You can easily decide between surgical steel 316L and flexible bioplast. Crystal fake plugs offer a large variety of different style opportunities. It starts with the material and the colour of the fake plugs and you may be also spoilt for choice because of the many different gemstone sizes and colours. To make you the decision a bit easier we would like to give some suggestions. Here are also some insights about which crystal fake plugs most of our other customers currently like. By far the most popular ones at the moment are the black crystal fake plugs made of 316L surgical steel. These black fake plugs are available in numerous colour combinations. There are white (transparent) crystals combined with red, black, pink, turquoise and green ones and we also offer variations where the colour of all rhinestones is red or clear (transparent). The fake plugs´plate size is 10 millimeters each. If black is not your favourite colour for jewelled fake plugs you can also buy them in silver here at flesh tunnel shop. These are available in the same crystal colour combinations like with the black fake tunnels and they are also made of premium 316L stainless steel. Sometimes it is hard to decide for only one crystal colour or even a colour combination. But don´t worry - there is a solution for any problem. :-) Just check out our fake plugs with colourful (multicoloured) crystals placed in the center of the fake tunnel plate. It shimmers in any colour you can think of so you will never have to decide for one colour again. If gold is the favourite colour for your jewelry we also may have the right product for you here in our shop. 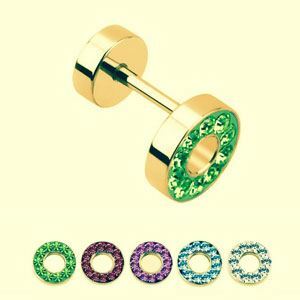 These are the golden fake plugs with crystals in various colours. They are also made from very robust, scratch resistant and anti allergic 316L surgical steel. You can select from different crystal colours like transparent, light blue, pink, red and green. All of these crystal harmonize in colour very well and they perfectly fit to the golden fake plugs. The plate size of these is 8 or 10 millimeters. Of course this is just a small selection of the numerous crystal fake plugs we offer. We also update our portfolio on a regular basis as soon as there are new trends in the piercing scene. So it is always worth to come along and check out the latest piercing studs here at flesh tunnel shop.